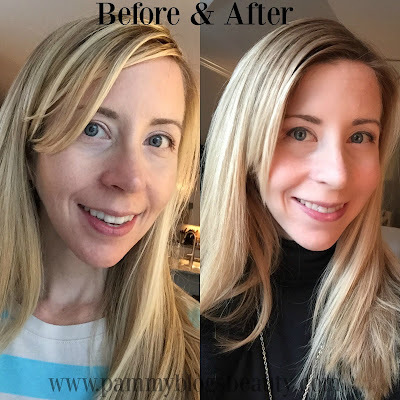 Pammy Blogs Beauty: The Conture Skin Enhancement System: Review and Discount Code! The Conture Skin Enhancement System: Review and Discount Code! Hey readers! 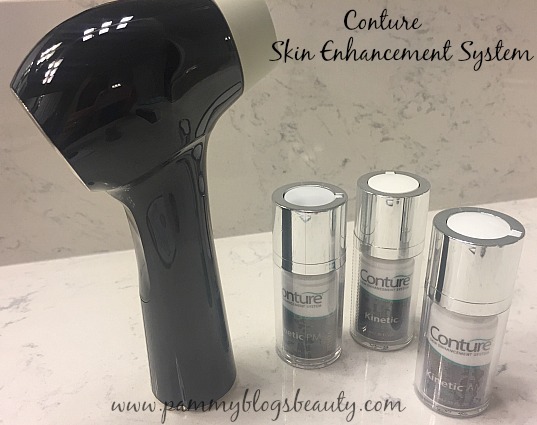 I am so excited to bring you Part 2 of 3-part blog series with the Conture Skin Enhancement System. My Part 1 Post gave you my first impressions of the product and some general information about the Conture System. Now, with this Part 2 Post, I will update you with how this system is working for me as well as go over more details about this device. 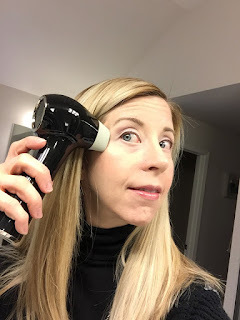 So, lets dive right into a skin update, details about the Conture Kinetic Skin Toning Device and the Conture Skincare Starter Kit, my inital results, and also a discount code! Before jumping into information about the Conture, let me tell you a little bit more about my skin. I am in my early 40s. So, I am starting to see some mild signs of aging in the form of fine lines. I am honestly pretty lucky here as the fine lines are really mostly apparent when my skin is a bit dehydrated. As far as skin type, I have combination skin with a slight tendancy for clogged pores in my t-zone area and the occasional breakout. Plus, my skin is also somewhat sensitive. This is what has held be back from a lot of professional-type devices in the past. I want to fight aging, but need to do so in a gentle way! I really love that the Conture Device is a high-quality skincare device that you can use right in your home...painlessly. As someone with sensitive skin, I shy away from many skincare devices for fear of aggrivating sensitive skin. The good news is that I have had no sensitivity reactions with the Conture! The Conture Skin Enhancement System is a non-invasive and painless way to improve the look of your skin and fight the impact of aging. 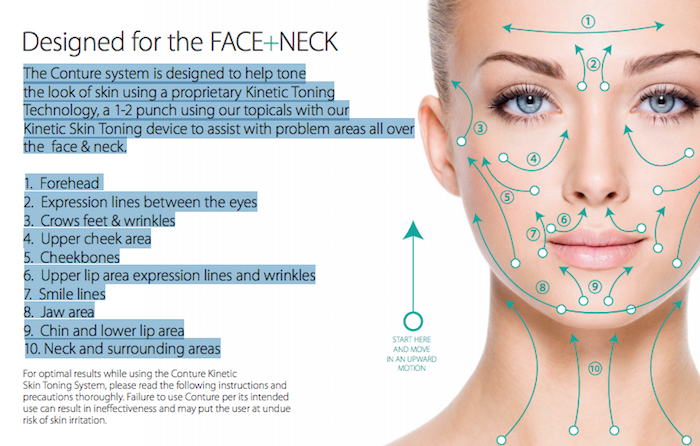 Lets review how the Conture Skin Enhancement System works. The Conture combines isometric compression with low frequency vibrations to stimulate and tone the skin. The device has a sucking/vibrating feel as you move it accross the skin. The feeling of the device takes a bit to get used to. However, it is certainly not painful nor is it irritating. Think of it this way...the sucking/vibrating action is "exercise" for your skin. According to Conture, this device is similar to ones used by professionals and in MedSpas. The Conture can help to enhance the skin's appearance and increase absorption of anti-aging products through the vibrating and compression of the device on your skin. Lets get more specific about the action of the device. The Conture device essentially forms a vacuum that lifts and releases the skin. This action is the isometric compression. The other way the device works is with the radiating effects of the low frequency vibrations. Clinical studies (from Conture) have shown that these vibrations stimulate the skin and can enhance absorption of topicals by up to 300%. 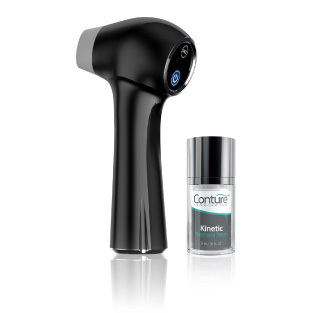 Conture recommends utilizing the device in specific target treatment areas. At 40+ years old, I am starting to show some signs of aging in the form of fine lines. So, I have been targeting the following areas: Forehead, Crow's Feet, and Smile Lines. These seem to be the primary areas that I am showing aging. Honestly, I am lucky, as a woman in my early 40s, I really have few and very mild signs of aging. So, I am not expecting "big results" as far as anti-aging. However, I do love the idea that this device might help in the absorption of my usual skincare and anti-aging products. As I mentioned, I have been treating the following areas of my face: Forehead, Crow's Feet, and Smile Lines. I follow the below graphic from Conture in reguards to placement and movement direction fo the device. I use the device as recommended and follow the movement patterns on the below graphic. Lets review exactly how to use the device. The device really is easy to use once you get the hang of it! It takes a little practice at first. However, honestly, now that I have been using the device for a few weeks, it really is simple and quick! Before you get started using your Conture device, I highly recommend watching the "How to" video on the Conture site. It really walks you right through using the device. At first, you do have to get used to that "sucking" sensation of the device on your skin. However, it certainly does not hurt and it does not seem to irritate my sensitive skin. Initially, the process seemed a bit time-consuming. However, as I got acclimated to the device, it has become totally automatic for me to use it in the evenings (I am only using once a day in the evenings). Start with cleansed skin that has been patted dry. Gently apply the Conture Kinetic Treatment Serum to your face lightly (don't rub in) in your desired treatment area. Work a few minutes on each treatment area zone (e.g., 2-3 minutes for your forehead). To use device, allow it to make a good connection with your skin and let it lift and release 3x and simply slide it over when it releases (overlapping slightly). Continue like this until you are done with your segment. You can complete your routine by applying either the Conture Kinetic AM Ignition Lotion or the Conture Kinetic PM Recovery Crème, and/or your own desired lotion or crème. So, lets talk a little more about my results! After using the Conture for a few weeks, I am seeing some noticable results! Granted, my results are very mild as I do not have a lot of signs of aging to begin with. Overall, my skin seems to feel more plump and smooth in the areas that I have been treating. My fine lines seem less apparent and I am please with that. Plus, I honestly have come to enjoy the gentle feeling of the device on the skin. It seems to invigorate my skin and is almost like a facial massage. Plus, I do love that the device is not painful and that it aids in product absorption for the skin. This means that the anti-aging products that I am already using in my skincare routine might be more effective for my skin because of my Conture device use! You really can't beat that! I am still excited to see more results in the coming weeks! 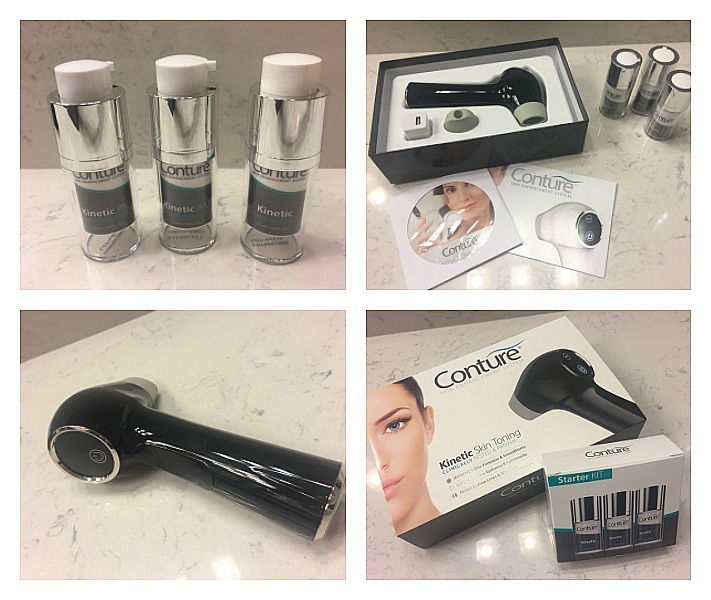 I really like that the Conture device can be integrated into your existing skincare routine. So, while you can use the products that come with the device, you can also use your own products in conjuction with using the Conture device with the Kinetic Treatment Serum. Stay tuned! I am going to follow up with a long-term results post in the coming weeks. So far, I am really enjoying my Conture device and you should definately look into this device if you are interested in non-invasive anti-aging skincare!! !